The Sole Secret used to come in only 2 sizes, medium and large. But what if you only have 4,5, or 6 pairs of shoes taking up useful living space, what if your entire shoe collection could fit in a box? Introducing the Sole Secret Mini. Its just like The Sole Secret, just smaller. If your entire shoe collection can fit in a box, make it a nice box with The Sole Secret Mini. 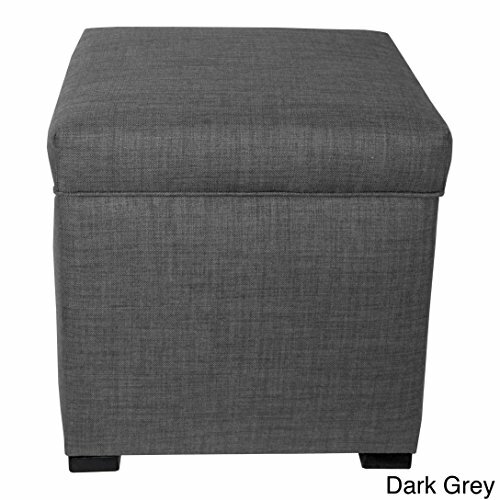 Made of 100% Polyester and upholstered by experienced craftsman, we are certain this multi functional storage ottoman would make itself right at home in your bedroom, entryway, office or living room. When you order one of these Sole Secrets you are ordering an innovative solution to keeping your shoes organized, stored and hidden from plain sight. The HJM Solid Series of colors is a back to basic approach, simple solid yet deep and vibrant colors. Comfortable padded and upholstered over a finely crafted wood frame. Turn it into a beautiful accent piece to your home decor and make it useful at the same time. Features and Specifications: - Measures 18.5" x 19" x 19"
Why Choose MJL Furniture Designs? MJL Furniture Designs is a USA based furniture manufacturer with a combined 45 years of experience in the upholstery industry. MJL Furniture manufactures stylish, affordable, quality furniture for the home and office. All products are made to order from our facility in Arcadia, California. MJL Furniture strives to produce new and innovative products that meet the ever changing demands of the home furnishings industry. Proudly Built By Hand and Upholstered in the USA with Only Premium Fabric, Foam and Hardwood. Each Storage Ottoman is Made To Order and Careful Attention Is Given To Each One. Measures 18.5" x 19" x 19" - Made of 100% Top Quality Polyester and Arrives Fully Assembled. No Tools, No Mess, Put it To Work The Moment It Arrives. If you have any questions about this product by MJL Furniture Designs, contact us by completing and submitting the form below. If you are looking for a specif part number, please include it with your message.